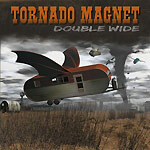 With San Diego country-rockers The Hideaways on hiatus, bassist/singer Phillip Bensimon is now fronting Tornado Magnet. Where Bensimon shared the songwriting and lead singing in The Hideaways, he wrote and sings on all 10 songs here. While the song topics are pretty much in line with what local roots rock fans came to expect from The Hideaways (good women gone bad, drinking, etc. ), Tornado Magnet rocks a lot harder than The Hideaways. It's still a countrified, roots rock, but where The Hideaways could have snuck into a country music festival, Tornado Magnet is far closer to the style and spirit of the Blasters or the Beat Farmers. What's lacking here is that one killer song that could establish this band outside the SoCal roots scene. The guys in the band can flat-out play, and Bensimon has a nice singing voice. They just need to write and/or find a radio-friendly tune to get themselves a foothold in the music business.